The new pedal is based on the concept of mixing together a clean signal with a distorted to be able to preserve low frequencies and find balance between distortion and definition. The option to activate a built-in compressor make possible to keep the note differentiation clearly audible even at heavily distorted sounds. On top of that this pedal offers unlimited pre-post mix tone shaping, through the unique features of a clean loop and a drive loop. So, the user can insert any other effect they wish within each loop to ’pimp’ the effect into your own signature effect! Example: add a graphic EQ to the drive, to change the character of the distortion.Or add your favourit compressor to the Clean Loop instead of using the built-in offered in the pedal. 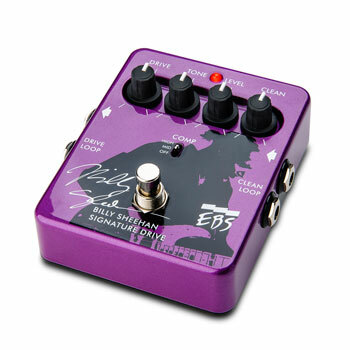 On the new extended sized stomp box from EBS, there are controls for Drive (gain for the overdrive engine), Tone (mid control for the drive), Level (sets level for drive channel post Drive Loop and pre final compressor) and Clean (sets level for the clean channel, post Clean Loop and pre final compressor). The pedal offers three different compression modes: High, Mid and Off. The level of compression on the Mid setting can be determined by the user through an internal trim pot. The pedal is available in stores world-wide! “This pedal is a distillate of several important principles in the signal chain for bass. This entry was posted in EBS Sweden AB - Press Center on April 1, 2013 by ebssweden. Hand in Hand Distribution Ltd – new EBS distributor in the UK! MUSIKMESSE 2015: NEW GEAR FOR BASS AND GUITAR FROM EBS!